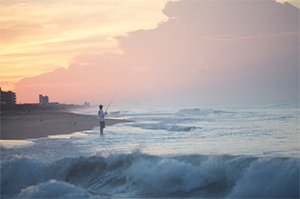 When you are planning a fall vacation filled with fishing, there is no better place to come than to Emerald Isle, NC. When the weather cools and the rest of the world forgets about summer, you can be on the water, enjoying the serenity and peace that only fishing can bring. It might come when you cast your first line and patiently wait on that tug of life. Or perhaps just taking in the fresh ocean air will allow all the stresses of life slip to away. Let us help you build your angling adventure with these tips and suggestions. Emerald Isle, NC., is full of incredible fishing spots that are sure to make every angler’s wishes come true. In the fall, the waters of the Crystal Coast are teeming with black drum, which often weigh in at nearly a hundred pounds. Whether you want to go for your biggest catch to date, or simply want to enjoy a leisurely fishing trip this fall, you can find what you are looking for at one of the many premier fishing spots on the Crystal Coast. Pier fishing is a great place to start for beginning fishermen. The water depths surrounding these structures attract a large range of species, from wahoo to red drum and more. 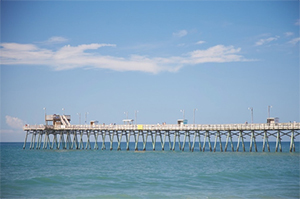 The Bogue Inlet Pier has been a local icon for 56 years and is the perfect place to cast your line. This fishing spot opens in March and closes at the end of November. To maximize your fishing time, there is a bait and tackle store with snacks, drinks & beach items right there on the property, no need to leave! Fort Macon State Park is a must-see that incorporates not only a fishing hot spot but a valuable Civil War history lesson. The fish are quite abundant in the inlet and the ocean. You can find bluefish, sea mullet, gray trout and various other fish species. After a great day near the water, you can enjoy the picnic facilities in the park. They include outdoor grills, picnic tables, shelters and restrooms. by wading in the surf or standing on the beach. The best time to fish is early morning, when the light is low and the fish are ready to feed near to the shore. Grab your poles and get ready. 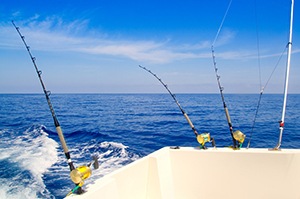 With so many fishing charters to choose from in the fall, it’s the perfect opportunity for an incredible Crystal Coast vacation, fishing and building memories with the family you hold dear. After a day spent catching beautiful fish, there is nothing better than sitting back and enjoying the bounties of your labor.  To aid with this, many of our Emerald Isle vacation rentals offer barbeque grills. Wrap up an amazing day of fishing with stories and freshly grilled fish. Nothing could be more gratifying. If you are tired after a long, exciting day on the water, there are countless seafood restaurants in Emerald Isle just waiting to serve up the catch of the day. Emerald Isle Realty is dedicated to helping you have the best vacation possible. Whether this means catching a charter to the best fishing spots or enjoying your freshly cooked catch at one of our relaxing vacation rentals, you can expect to have the time of your life. If you are ready for a fishing adventure, contact us today at (866) 549-2455 to learn more about our amazing vacation rentals. Find out more about the North Carolina fishing license information.